Downloading music unleashed the digital era and exploded interest in music, and the same is about to happen for radio. A huge library of AM/FM shows can be recorded and downloaded using DAR.fm - the DVR for radio. Daily or weekly shows can be scheduled for periodic recording. Once recorded, shows can be automatically downloaded to Android devices, iOS devices and PCs, making anytime listening convenient. All shows are downloaded in MP3 format making them playable on any modern phone or tablet. "Radio is too rigid and still forces listeners to adapt to the broadcasters schedule." says DAR.fm CEO, Michael Robertson. "Now with MP3 downloads directly to smartphones, the latest broadcast is always a click away on that commute or exercise time. Pandora is showing that 70% of music listening is mobile so its logical to assume talk radio will be the same and now it's practical." 20,000 shows from more than 5,000 radio stations are cataloged at DAR.fm, including every top AM/FM show. Clicking the Record button for any show creates a lifetime pass where all future broadcasts are recorded for personal playback on the DAR.fm web site. Beginning today, free apps are available to download recordings directly to smartphones. 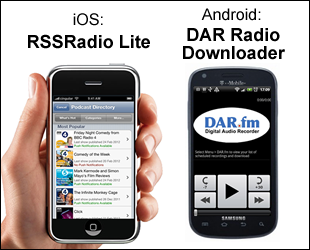 The free Android app is called DAR Radio Downloader. iOS users can install the free app RSSRadio Lite. Both apps can be configured to connect and download recorded shows at regular intervals for example every hour, 4 hours, etc. Multiple shows can be downloaded simultaneously over 3G or limited to only wifi to avoid mobile data usage and take advantage of fast home or work networks. Background playback is supported including ability to change the playback rate to speed through episodes. Downloading shows as MP3s is useful for anyone without fast, always available net connectivity. Radio shows can be played where no 3G service is available either because of poor connectivity such as subways, planes or dead zones. Even those without a 3G or those concerned about data charges can download over wifi and listen later. Because the entire show is downloaded unlimited rewind and fast forward is possible.